How to manage your life and not let it manage you. This book will stir and challenge you. Do you say 'yes' to requests when really you mean to say 'no'? Do you feel permanently trapped by your 24/7 lifestyle? Do you feel guilty when you look at the size of your email inbox? Do you ever wonder who hit the accelerator? While offering practical help to busy Christians, Tim Chester also opts for root-and-branch treatment: it's not enough to slow down, or to simplify your lifestyle, you need to deal radically with the things that are driving you. Think again! At the root of our 'slavery' are serious misunderstandings, often reinforced by our culture. If we want to be free, then we need to counteract them with God's word. It's important to manage our time, but it's more important to manage our hearts. God has promised his rest to all who are weary and burdened (Matthew 11:28). It's up to us to accept it. 1. Slow down, I want to get off! 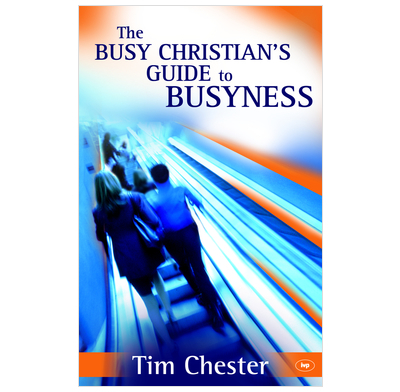 Tim Chester gets to the heart of why we are too busy, and unmasks the deceptions that drive our behaviours. This helpful book offers many practical time-saving tips and a biblical treatment of the busyness disease afflicting so many of us. Heeding this book will free you up to spend more time doing the things you really should be doing. Stand back and stake stock now - or get stuck on the treadmill of life and regret it later. Tim Chester has done a great job of treading a fine line between "self-help - here's how to get things done more effectively" and "God-help - from the Bible, here's what God's plan is for your life, and how he wants you to live." Having bought this back in Nov 2007, I decided that I'd review it, but my "busyness" prevented me from accomplishing that until now. How I wished I'd read it before. Chester's construction of the book is pastorally helpful and biblically faithful. He offers reasons on why we're so busy, answers the poignant question "Is being busy bad? ", looks at how we can work better, and sort out our priorities better. But most importantly, and finally, he addresses the idolatrous tendencies that work can create, and a biblical "destruction" of those idolatries. By this point in the book, I had thought "Great, now I have lots of ways of working faster and smarter; I don't need to read the rest." In fact, I would argue that this latter section is just as important, if not more so. I found this a very helpful book which identified some areas in my life which need attention (some of them unexpected) and gave guidelines on what to do about them. Useful whether you think you are too busy or not.